I found this recipe for Peanut Butter Quinoa Cookies and it caught my eye because I think anything with peanut butter must taste good. I think its a good healthy cookie to have around instead of the sugar filled ones . 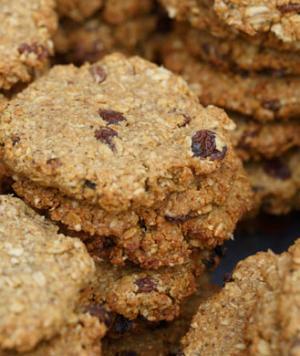 Greasy peanut butter cookies get a healthful twist! Commonly used in salads or entrées, nutrient-dense quinoa grains take center stage in this simple recipe. Quinoa gives the cookies a full nutty flavor, while natural peanut butter, raw honey and cocoa nibs promise a dessert that’s still sweet. Preheat oven to 170 degrees. Mix all the ingredients together in a bowl. Line a cookie sheet with parchment paper. Flatten tablespoons of the mixture onto parchment paper and bake for approximately one hour.